The dreaded, "We've already read that Miss Schreiber!" Enter, I'm in Charge of Celebrations by Byrd Baylor. I found this book via another school's writing workshop unit plan's suggested title! SCORE! 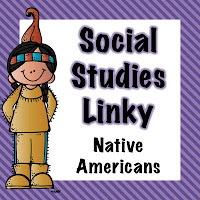 The book's central character is a Native American girl. Everyone thinks she's lonely living out in the desert. Who'd want to live there? Great connection the Southwest - right Social Studies teachers? But, it's just the opposite. She names off all the plants and animals that live there and states that she could never be lonely! She then goes on to talk about how she's in charge of celebrating special days in her life. Not her birthday or holidays like we'd think of... but days when special things out of the ordinary happen. She has a triple rainbow day. A green cloud day (for some reason this is ALWAYS my students favorite), a dust devil day, etc. Here's an except for the Dust Devil Day. After reading a few or all of her special celebrations... I have students think of special moments in their life - big or small that they would want to celebrate. We jot them down on a chart so that we can use them for writing inspiration later in the year. We have some prompts on the chart to help get some of our students thinking... The first time I.... My favorite... I got this scar when... etc. *Wish I had thought to take some pictures of the students' journals... maybe tomorrow! This book could also be used to make some social studies connections. It could easily be used to tie into Southwest Native Americans especially Southwest Native Americans today! Students can infer about daily life, customs, practices, and the environment. It's definitely worth checking out from the library! We're not quite at Native Americans yet this year so I didn't go too far in depth with the connections but many of my students used their previous knowledge to make the connections that Native Americans value and respect animals/nature which is why she celebrated a Coyote Day and left a special feast for him. Give the book a look and don't forget to check out Diane at Fifth in the Middle's Native American linky party going on right now! There are many more great ideas being shared! This book will be on my shopping list :) Thanks for linking up! Reading Byrd Baylor is like listening to spa music. It's so soothing. I love Everybody Needs a Rock. Thank you for sharing this title. It is perfect for writing workshop! In most cases parents give homework as a way of preparing children for the next lesson. Therefore it is important that children take their homework seriously so as to get a clue of what a teacher may be preparing to teach the following lesson like bestessays.com coupon online for education. This will help the student to understand the concept better as the teacher presents.